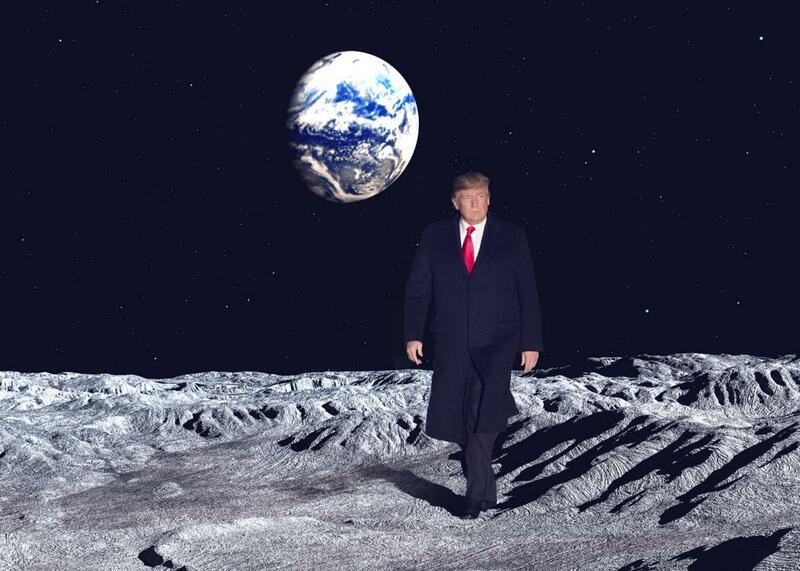 Trump needs private space companies to return to the moon. They don’t want to go. Trump Wants to Go to the Moon. Do Private Space Companies? Space exploration is done via partnership these days, and the private sector is generally less enthused about more moon landings. Photo illustration by Natalie Matthews-Ramo. Photos by Sergydv/Thinkstock and Chris Kleponis-Pool/Getty Images. The White House thinks it can use crewed lunar missions to bolster its relationship with the commercial space industry. The only problem with this reasoning is that the commercial space industry isn’t really that interested in the moon—they have their sights set on loftier goals, and there isn’t really great evidence that a pit stop at the moon will help them achieve these aims. If there are valuable resources on the moon to mine, the investment could pay off. But so far we don’t have a clear enough picture of what might be worth taking to warrant the investment of sending people up there. Helium-3 has been touted as one resource, but there’s no certainty it’s available in large quantities on the moon, nor is there a financially sustainable method of extracting it and transporting it back to Earth yet. Similarly, there could be huge reserves of water ice on the moon, which could give rise to a water-based lunar economy, but that is similarly hypothetical and hard to establish. We could verify that with more investigation, but it would be faster (and cheaper) to do that with robots, not people. Perhaps this explains why so few private companies have lunar ambitions. Astrobotic, Moon Express, and Blue Origin are developing robotic technologies relevant to delivering cargo to and from the moon, which could support something like a mining operation, but this doesn’t actually require them to land on the moon. Similarly, others, including Lockheed Martin and Boeing are focused on getting to the moon—but to orbit it, not to land on its surface. And both companies are already partnering with NASA to develop architectures related to the Deep Space Gateway, a space station capable of moving between Earth and the moon, as a staging platform for human missions to Mars in the 2030s, and places beyond after that. It’s understandable that even though private industry might be more jazzed about Mars, they’ll still follow the money to the moon. If the government is offering lucrative contracts to commercial players for lunar missions, few companies are going to say no. If private companies want to go to Mars to make money, then isn’t it already in their financial interest to use the lunar surface as a proving ground for testing and developing new technologies? Maybe! But that reasoning is somewhat tenuous. The moon might be a useful way to test out certain technologies relevant to traveling to and living on Mars—Pratt cites remote navigation instruments and guidance tracking—but these things could be tested remotely from orbit. But humans don’t need to land on the moon and build a lunar colony to train for Mars. There’s no lunar atmosphere, which makes testing launch and entry technologies designed for Mars irrelevant. The utter lack of climate and lower gravity means the two worlds require vastly different life-support system designs. There are more abstract reasons for the U.S. to go to the moon (mostly that it could be a PR win for our country and our president), but for the private industry, it would most likely mean forgoing the long-term vision of Mars in favor of short-term gains. If the government is ponying up the cash, though, the commercial sector will have little trouble making that pivot—maybe with one eye still on the red planet.